The London Contemporary Orchestra showcases three contemporary works by Claude Vivier, Martin Suckling and Grisey, conducted by Hugh Brunt. Polish violinist Agata Szymczewska is the soloist this evening at the world premiere of Martin Suckling's latest composition. Claude Vivier composed "Pulau Dewata" in 1977 following a trip to Bali in tribute to the beauty of the place and its people. The island is the inspiration for the piece and the dances and rhythms compose the spirit of the work. Vivier has called it "an explosion of life, simple and candid". the nine short sections of this violin concerto are little bubbles of music in which the violin and ensemble come into a particular relationship and hover there for a few moments before disintegrating into something new. Each ‘bubble’ behaves quite differently: some hang in the air relatively serenely while others are considerably more volatile and unpredictable. The problem here is to enter the depths of my recent research on the use of the same material at different times. The three basic forms are the original event - a sinusoidal wave - and two continuous events, an attack with or without resonance as well as a sound held with or without crescendo. There are three various spectra: harmonics, 'stretched disharmonics' and 'compressed disharmonics'; three different tempos: basic, more or less expanded, and more or less contracted. Agata Szymczewska (born 1985 in Gdańsk, Poland) received her musical education in Koszalin, Poznań and Hannover. 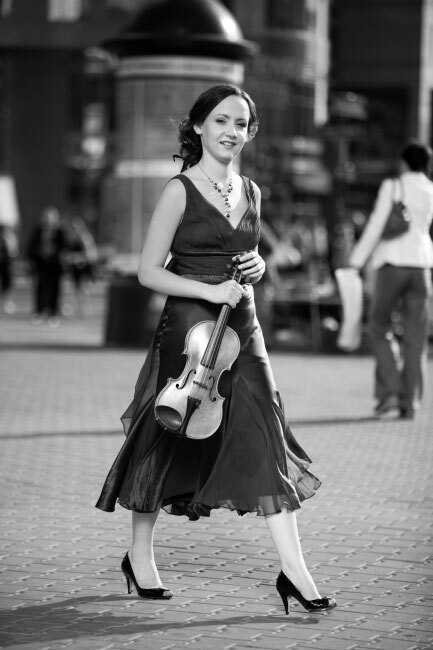 In 2006 she was awarded first prize in the prestigious Henryk Wieniawski Violin Competition in Poland. Previous honours include the Lotos Gdańsk Prize in 2005, Concerto Competition in Calgary, Candada in 2003 and the Yampolski International Violin Competition in Moscow, Russia in 2006. She has performed at many of the world's most prominent concert halls, including Victoria Hall in Generva, Berwaldhallen in Stockholm, Bolshoi Theatre in Moscow and more throughout Europe, Asia and the Americas. In 2005 she was invited by Seiji Ozawa to be the first musician for his orchestra on its Japanese and European tour that year. In 2009 she was nominated for Poland's most important music prize, the Fryderyk award, for the Best Recording of Polish Music and Album of the Year in the Symphonic and Concerto category. She plays a 1680 Cremona produced by Antonio Stradivarius, donated by her by the Deutsche Stiftung Musikleben. over 90 years old. Summer and Winter Festival concerts take place in some of London’s most distinctive buildings, including Hawksmoor’s Christ Church Spitalfields and the Palladian6style Shoreditch Church. There next performance of de sol y grana with Polish violinist Agata Szymczewska and Southbank Sinfonia will take place on in May 2012 at St John’s, Waterloo as part of Southbank Sinfonia’s Rush Hour series.